Amid Kashmir Crisis, China, India, Russia Condemn "Use of Terror for Geopolitcal Goals"
It does not seem likely that this statement was issued solely for Pakistan's benefit. Keep in mind the other day China was calling for cooler heads to prevail. On Wednesday, the foreign ministers of Russia, India, and China met for the 16th ministerial meeting of the Russia-India-China (RIC) trilateral in Zhejiang, China. 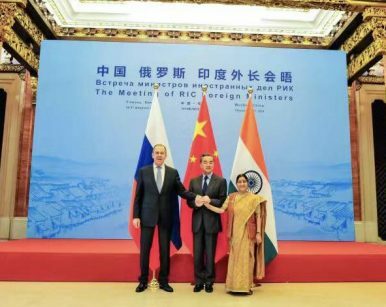 The meeting was the first high-level diplomatic interaction between Indian External Affairs Minister Sushma Swaraj and her Russian and Chinese counterparts, Sergei Lavrov and Wang Yi respectively, since the Tuesday morning airstrike by the Indian Air Force on Pakistani territory. India is seeking diplomatic support for its position after its strike on Pakistan. On Wednesday, as the RIC was meeting, Pakistan undertook strikes of its own against Indian positions in Indian-administered Kashmir. With the crisis in full swing, the RIC is just one of several forums where India would be looking for support. China, notably, is Pakistan’s “all-weather” diplomatic partner and has shielded Islamabad from international scrutiny in the past. Most important for India, however, was the inclusion of language that the three ministers “stressed that terrorist groups cannot be supported and used in political and geopolitical goals.” Though Pakistan and Jaish-e-Mohammed — the terror group that claimed the February 14 attack on Indian paramilitary personnel that sparked the current crisis — weren’t named, the language implicitly supported India’s position. Separately, the joint statement called for “those committing, orchestrating, inciting or supporting terrorist acts” to be held to account. 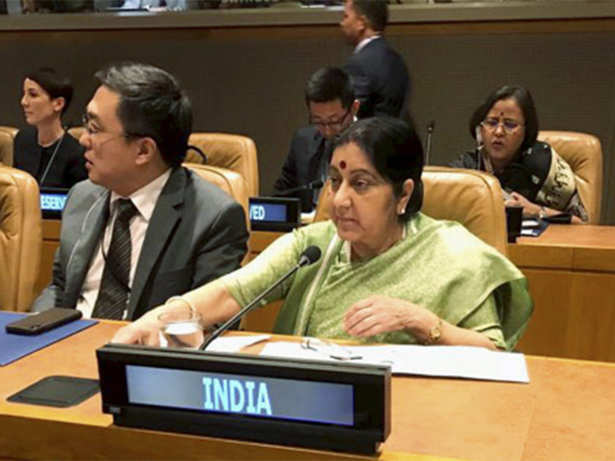 The language does not break through a major impasse that has separated India and China, in particular, on Jaish-e-Mohammed: the listing of the group’s leader Masood Azhar as a “global terrorist” under United Nations Security Council resolution 1267. Over several years, China has used a technical hold to prevent his designation. But, on balance, taking the reality of Chinese and Russian preferences into account, the RIC trilateral statement is probably as good an outcome India could have hoped for. The statement came at a critical time in the ongoing crisis, with New Delhi now considering its possible retaliation for Pakistan’s strikes on Wednesday. If India chooses to press ahead, the crisis may escalate into an all-out war of sorts. But if India resorts to diplomatic efforts to push back on Pakistan and isolate it, this kind of support might go a long way. China won’t change its strategic posture of support for Pakistan anytime soon, of course, but even Russian support would be valuable for New Delhi‘s diplomatic efforts. Interestingly the author viewing the statement as one that was "somewhat surprisingly" made indicates to me, this is quite possibly an unexpected change in stance. "How a nuclear war between India and Pakistan could reverse global warming"
From the nutty carbon cult- Even if this is tongue in cheek it's in such poor taste .. One wonders why it was seen fit for publishing? "To be abundantly clear, what follows isn't meant as a how-to guide advocating nuclear war as some sort of out-of-the box alternative solution to climate change"
What frightens me, personally, is some crazed persons may see this as viable. Including crazies at NASA who actually entertained this idea. Going so far as to create models and generate reports? Why? We're they thinking about geo engineering projects to "save" the planet? "In 2011, NASA scientists released a report based on a model that predicted the climate effects of the use of 100 Hiroshima-size bombs in a regional conflict. That's because the bombs would inject up to 5 megatons of black carbon into the upper troposphere, the highest point of the lowest layer of the Earth's atmosphere. As National Geographic wrote, "In NASA climate models, this carbon then absorbed solar heat and, like a hot-air balloon, quickly lofted even higher, where the soot would take much longer to clear from the sky." These carbon clouds were projected to cause temperatures to fall 1 degree Celsius, or 1.8 degrees Fahrenheit, over the first three years, then to as low as 2.25 F before starting to creep back up. Even after 10 years, temperatures would still be expected to be 0.9 F lower than they would have been without the nuclear war"
Agriculture ... would likely be disrupted from the combination of cooler temperatures, less precipitation and decreases in solar radiation reaching the surface," the lead scientist on the study, Luke Oman, said. "This would cause widespread interruptions to growing seasons by producing more frequent frosts." Truly think about why it is the carbon cult, yes it is a cult, insists that global temperatures need to be reduced to levels below that of a limited nuclear war (nuclear winter) which would result in even worse global famine and disruption to global agriculture? As a means to save the world? Why does this not strike the true believers as an anti human global depopulation agenda when it so obviously is? Pakistan serving as one means of 'stirring the pot' between the two nations. Keep in mind that a terror attack, from Pakistan, was also made into Iran just ahead of the Kashmir incident. Pakistan has it's own reasons to go along with the US as well. Not the least of them being massive military funding. That's correct there was a terrorist attack in Iran. The very day of the Summit in Sochi. Message to Iran? You betcha! This has ignited a debate about whether American pressure on India, and India’s continuing efforts to strengthen its relationship with the US, could potentially overshadow New Delhi’s policy towards Iran. Interesting to understand that Modi's "Look West Policy" would certainly raise the ire of the America and definitely result in media terminology being tossed around like "Hindu-fascist" in order to discredit the Indian leadership. ‘Gadkari’s rings’ around the Chabahar Port in the remote province of Sistan-Baluchistan in southeastern Iran are phenomenally transforming the India-Iran relationship. The first definitive signs of this appeared in December when the quiet, intense discussions between New Delhi and Tehran under Gadkari’s watch resulted in the agreement over a new payment mechanism that dispenses with the use of American dollar in India-Iran economic transactions. However, the 3-day visit to Delhi by the Iranian Foreign Minister Mohammad Javad Zarif on January 7-9 highlighted that the application of the payment mechanism to the Indian-Iranian cooperation over Chabahar Port holds seamless potential to energize the economic partnership between the two countries across the board. In a historical sense, an opportunity is at hand to make the partnership, which has been ‘oil-centric’, a multi-vector ‘win-win’ relationship. Hindu fascist or non subservient to the empire? The meeting between Gadkari and Zarif in Delhi on Tuesday signaled that the two sides have a ‘big picture’ in mind. Thus, the opening of a branch of Bank Pasargad in Mumbai is a timely step. Pasargad is a major Iranian private bank offering retail, commercial and investment banking services, which provides services such as letters of credit, treasury, currency exchange, corporate loans syndication, financial advisory and electronic banking. (It is ranked 257th in the Banker magazine’s “1000 banks in the world”.) The Bank Pasargad is establishing presence in India just when the Chabahar Port has been ‘operationalized’ and a first shipment from Brazil carrying 72458 tons of corn cargo berthed at the port terminal on December 30. 1979 brought the military and the intelligence agencies of the United States and Pakistan into a partnership. Along with Saudi Arabia, they worked covertly to support the Afghan resistance, the mujahadeen, against the Soviets throughout the 1980s. Amid a bitter rivalry with India, Pakistan became a nuclear power after testing its first bombs in 1998. Pakistan began its nuclear efforts during the 1950s as an energy program. It was prompted in large part by the United States’ “Atoms for Peace” program, which sought to spread nuclear energy technology across the globe. In 1956, the Pakistani government created the Atomic Energy Commission (PAEC) to lead the new program. The United States gave Pakistan its first reactor—the five megawatt Pakistan Atomic Research Reactor (PARR-1)—in 1962. During this early period, PAEC chairman Ishrat Usmani devoted government resources to training the next generation of Pakistani scientists. Usmani founded the Pakistan Institute of Nuclear Sciences and Technology (PINSTECH) in 1965 and sent hundreds of young Pakistani students to be trained abroad. Finally, keeping in mind the Pakistani ties to Saudi Arabia AND 9/11. Speaking of 9/11? Check these links. Boy, oh boy do I remember 9/11. Meanwhile, sources in the Middle East confirm that Atta and two other men wired more than $15,000 back to the United Arab Emirates just before the attacks -- what may have been leftover cash from the terrorism funds. The money went to a man who flew out of Dubai for Karachi, Pakistan, on September 11 -- the day of the attack. Atta sent $5,000, according to the sources. His Florida roommate, Marwan Al-shehhi, wired $5,400. A third man, Waleed Alshehri, sent slightly more than $5,200. The FBI has listed all three as being aboard the two planes hijacked in Boston and flown into the World Trade Center. Atta and Al-shehhi are thought to have been the pilots on those two jetliners. Officials in the United Arab Emirates have identified the recipient of those wire transfers as Mustapha Ahmad Al-Hawsawi. They are investigating whether he may have any ties to Al Qaeda, the terror network headed by bin Laden. The transfers took place September 8 and 9 -- only a couple days before the hijackings. "the video posted by him was not of the second IAF pilot flying in Pakistan airspace, but of an IAF pilot who was involved in a flight crash in Bengaluru last week while rehearsing for the Aero India 2019 air show." What is interesting to me is a timely oped. A problem, reaction, solution type oped. Asking the question " Is Trump Needed to Keep Peace in Asia?" My response is emphatically: NO. Trump/USA isn’t needed to keep the peace. In fact quite the opposite is true. Asia needs less Trump/USA. But that wasn't going to be the case. The presence of Trump/ USA, embodied in their proxy Imran Khan, after a soft coup had taken place (2017), was inevitably going to lead to this very hornet’s nest getting all stirred up.Problem, Reaction, Solution. (Dialectics that rely on the evolution of ideas over longer time periods in the real world) We've had two years of unfolding. We now also need the White House’s speedy intervention to prevent the clashes over Kashmir getting dangerously out of hand. Today Pakistan claims it has shot down two Indian jets over its territory. This was because India was apparently retaliating against the Pakistani retaliation that followed the Indian raid on Pakistan-based militants earlier this week, which itself was a retaliation after a bloody terrorist attack by those militants in India last month. Did you follow all that? To add petrol to the flames, India is facing a looming election and passions are running high. The claims and counter-claims are not the real issue. The problem is that neither of these huge, populous nations has found a stable way of living next to each other. This claim of neither nation being able to live next to each other is rubbish. India believes with some force that elements of the Pakistan state give succour to terrorism. Pakistan believes, with some force, that India’s huge army exists to threaten it with invasion. Both have acquired nuclear weapons which they aim at each other but lack the complex protocols and hotlines that emerged to prevent tragic miscalculation between the US and the Soviet Union during the Cold War. We would hope that the rest of the world could broker a détente. But Britain, despite its ties to the subcontinent and large diaspora, is paralysed and diminished by Brexit; the EU lacks a robust foreign policy; Russia is a mischief maker; and China is not yet a mature enough player on the global stage to be a peace broker. So it falls, once again, to the United States to be the world’s policeman. You may not want to hear it, but we need Donald Trump. Looks as if the encouraged crisis may just lead to the desired solution. As the US/France/Britain retain their occupation forces in Syria.. Hoping readers understand now why it is I pointed out that a coup had taken place in Pakistan? My suspicions regarding the placement of Khan in the leadership role? Perhaps it's a bit more clear why these actions couldn't be seen as positives for the region by your's truly? My final question is again to the alternative media ( I do not consider myself a part of that) why was no one else suspicious? The regional remake won't end till it's done. What will finish it? How it will end? Unknown. What seems certain is we aren't there yet. France and Britian are the allies on the ground with the US in Syria. There are others, including Israel, but, the three stooges form the foundation of the occupying forces. Along with the United States, they have provided training, supplies, logistics and intelligence for the Syrian Democratic Forces, the Kurdish-dominated group that has done most of the fighting. U.S., French and British ­forces also operate heavy artillery and conduct the airstrikes that have been decisive against the militants." And they aren't staying unless the US stays. Since the US was never leaving there wasn't a thing to worry about... nothing is changing. Not that it ever was going to. Sure numbers of boots on the grouns are being claimed. Meaningless, really. Since it's unknown exactly how many US troops are presently in Syria. And a quick reclassification of those troops will just as quickly and just as effectively have them "leaving Syria". Troops are/will continuing to occupy and annex Syria. The Syrian Democratic Forces (SDF) has handed over more than 150 Islamic State (IS) militants it had captured to the Iraqi government. The majority of them are Iraqis and the convoy was under maximum security protection headed to the Jazeera and Badiya military headquarters,” the official revealed. Washington Post con't...."For its part, the SDF has appealed for Western nations to keep a force of up to 1,500 in northeast Syria to coordinate air support and back its efforts to hold militants and other adversaries at bay. Bolton has told allies that even if they withdraw from northern and eastern Syria, U.S. troops will remain at the American garrison at Tanf, on Syria’s southern border with Jordan. Bolton is the administration’s leading hard-liner on Iran and believes, as he recently told reporters, that Tanf “is still very strategically important in connection with our determination that Iran not achieve this arc of control stretching” from Tehran through Iraq, Syria and Lebanon." "The US and NATO allies are in the process of assembling what officials are calling a "monitoring and observer" force of roughly 800 to 1,500 troops to maintain a safe zone in northeastern Syria. The goal of the force would be to maintain a buffer between Turkey and US-allied Syrian opposition forces to ensure that neither side carries out attacks on the other"
Repeating: The goal of the force would be to maintain a buffer between Turkey and US-allied Syrian opposition forces to ensure that neither side carries out attacks on the other. "A US defense official said the force would also have the aim of preventing an ISIS resurgence in northeast Syria though it is not clear whether they would be involved in training or advising local forces as part of this effort." I'm really uncertain why it continues to go unmentioned/unreported in the so called 'alternative media' aka anti imperial media that the 'buffer zone' is being created for the additional reason of targeting Turkey? To prevent Turkey from protecting the state, it's border, it's own territory. The absence of reporting on this fact in the authority challenging media is beyond my comprehension? The msm doesn't really hide it..They gloss over it, but, it's still there. As has already been written the buffer zone is desired by the three stooges and company so Turkey can be targeted. Syria can be occupied and annexed. Regional remake can advance. The news doesn't even mention Turkey as a US ally- HELLO!! "Turkey and US-allied Syrian opposition forces"
1- Based on what’s being reported India launched limited air strikes. 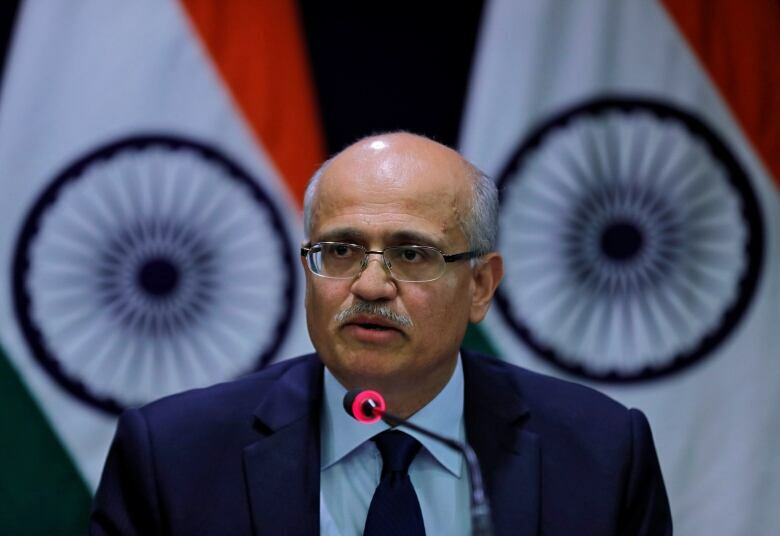 Indian Foreign Secretary Vijay Gokhale says aircraft targeted Jaish-e-Mohammed camps in a pre-emptive strike. This comes as Pakistani military officials had earlier said that the Indian fighter jets had intruded 3 to 4 miles in Muzafarabad and were forced to retreat by dropping their payload hastily after facing on time response from the security forces. Today’s airstrike was carried out in response to the February 14th suicide attack in Pulwama which claimed the lives of more than 40 Indian soldiers. 2- Pakistan is claiming they will respond. In time. Pakistan’s National Security Committee (NSC) said on Tuesday that the country will respond “at a time and place of its choosing” to the air strike on Pakistan by Indian Air Force (IAF) which took out a major camp of Jaish-e-Mohammad (JeM) in Balakot. Following a meeting chaired by Pakistan Prime Minister Imran Khan, the NSC issued a statement saying that “India has committed uncalled for aggression”. Dawn reported that the committee “strongly rejected Indian claim of targeting an alleged terrorist camp near Balakot as well as the claim of heavy casualties”. “Once again Indian government has resorted to a self-serving, reckless and fictitious claim,” the statement said. “This action has been done for domestic consumption being in election environment, putting regional peace and stability at grave risk,” it said. The Pakistan government said that it will take domestic and international media to the site of the air strike for them to “see the facts on the ground”. “Forum concluded that India has committed uncalled for aggression to which Pakistan shall respond at the time and place of its choosing,” it said. Khan also directed Pakistan’s armed forces and citizens to “remain prepared for all eventualities”. He also summoned a special meeting of the National Command Authority on Wednesday. The NSC meeting was attended by Chairman Joint Chiefs of Staff Committee General Zubair Mahmood Hayat, Chief of the Army Staff (COAS) General Qamar Javed Bajwa, Chief of the Naval Staff Admiral Zafar Mahmood Abbasi, Chief of the Air Staff Air Chief Marshal Mujahid Anwar Khan and other military and civilian officials, including cabinet members. (Pak military) most likely do, so the response will be covert vs overt. In my opinion. Most likely taking the form of still another terror attack. Which will allow the Pakistan government to operate at arms length from the attacks. Simultaneously playing the ‘tough on terror’ card., yet giving cover to the numerous terror groups that operate from multiple areas within Pakistan’s territory. Two Days Before 46th Session Will be Attended by India’s foreign minister- I hope this will signal something postive, but, not likely. In fact it feels to me almost as if an ambush of India’s FM ( first image above) is being planned. Hope I’m wrong, of course. As the deadly Feb. 14 attack in Kashmir continues to rock Indian-Pakistani relations, the Organization of Islamic Cooperation (OIC) on Tuesday met for an urgent meeting to discuss the disputed region. Pakistan Foreign Minister, Shah Mehmood Qureshi, told a press briefing in Islamabad today that at Pakistan’s request, the OIC on last Sunday scheduled an emergency meeting in Jeddah, Saudi Arabia of its Contact Group on Jammu and Kashmir. The meeting comes in the aftermath of this month's attack in Indian-administered Kashmir, in which 44 Indian soldiers were killed. New Delhi squarely blamed Islamabad for the attack, which was claimed by the banned Jaish-e-Muhammad (JeM) militant group. Pakistan denied any involvement. The meeting comes two days before the OIC Council of Foreign Ministers meets for its 46th session in Abu Dhabi on March 1 and 2. For the first time in the 50-year history of the Islamic bloc, the Abu Dhabi session will be attended by India’s foreign minister as a “guest of honor,” as invited by the United Arab Emirates. "We hope that both India and Pakistan can exercise restraint and adopt actions that will help stabilise the situation in the region and improve mutual relations," China's Foreign Ministry spokesman Lu Kang said. I'm with China on this one. Cooler heads need to prevail. Had read this yesterday...though it is from last week. Imran Khan certainly fanned the flames with this speech. Leaving India with no options but to respond to the challenge. The real political thrust of the speech lies in taunting, challenging and threatening Modi by in turn. It is a call to political duel where Imran Khan is confident that he holds the advantage. Imran Khan failed to condemn the Pulwama attack — although Jaish-e-Mohammed had claimed credit for it. Imran Khan directly addressed Modi twice in his address. He first taunted Modi as a politician who is “stuck in the past” who still seemed to think that as in the times of “Mian” Musharraf, he could get away by treating Pakistan as a “whipping boy”. Imran Khan reminded Modi that on the contrary, he is dealing with an adversary whose grit and vile will prove more than a match for him. In fact, he exuded a confident tone throughout and spoke resolutely without at any time getting agitated or indulge in any theatrical outburst. While those kind of tough talks play well domestically, sitting here in Canada, it feels like a shroud of doom descending on the planet. Two nuclear armed nation states..
Imran Khan’s speech contained three key elements. First and foremost, his pointed reference to the situation in Jammu and Kashmir is highly significant. He implied that India has virtually lost Kashmir due to the disastrous policies pursued during the last 5 years — Modi government’s approach of “one dimensional (state) oppression, torture and resolving issues through military”. Nor did he care at any point to appeal to the international community. There was a tone of triumphalism throughout in his remarks — that it is check-and-checkmate for India in J&K. Of course, Imran Khan didn’t say what brought about the military stalemate for the Americans and NATO in Afghanistan — namely, Pakistan’s sustained backing for the Taliban insurgency. But his message is that a similar fate awaits India in the Kashmir Valley where also a stalemate is steadily developing on the ground. Indeed the article below has it all. But, I’ll just share the obvious hot button memes being bandied around. hot button: a topic or issue that is highly charged emotionally or politically. Al Qaeda in the Arabian Peninsula (AQAP) achieved its high-profile blow against USS Cole and the West with simple technology — a rubber dinghy armed with plastic explosives and suicide bombers, employed like a torpedo. Likewise the 9/11 attacks themselves would use low-tech means to achieve spectacular results. For the next 9/11, look to Yemen’s “Houthis” so-called by the Western press for their late leader Abdul Malik al-Houthi — which misnomer displays the same kind of ignorance that blinded Washington to the threat from al Qaeda, before 9/11. The “Houthis” call themselves “Ansar Allah” (“Supporters of God”) and are a Zaydis/Shiite version of radical Islam dedicated to the universal triumph of their apocalyptic creed “uber alles” to borrow a phrase from Nazi Germany. Ansar Allah’s closest allies — Iran and North Korea. only with box cutters and four hijacked airliners. Ansar Allah has ballistic missiles and allies nuclear-armed North Korea and near-nuclear Iran. Iran successfully launched a Scud missile off a freighter — a technique that could be used for a nuclear strike on Washington. Will the next 9/11 be nuclear terrorism? Any thoughts? Other then, the usual suspects may be up to no good? "In a briefing on December 14 last year, standing in a DC warehouse in front of debris of a missile recovered in Saudi Arabia, Nikki Haley, the US ambassador to the United Nations, pointed at other similarities such as the location of valves and vents in the tanks. Furthermore, the logo of an Iranian manufacturer was visible on some of the debris"
"The most common version of the Scud, known as the SS-1C Scud-B, had a much shorter range of roughly 300 km with a 990 kg payload. It first flew roughly 70 years ago. It seems surprising that a variant of such an old missile would have the range to reach Riyadh"
And yet the author of the WT's oped expects readers to believe the 70 year old technology is going to deliver a nuclear payload to Washington? My hubby points out that even if some 'scud' missile was actually deployed it would or should be easily intercepted. It is improbable that Prime Minister Narendra Modi holds a motor car driving licence. And it is an intelligent guess that even if he did possess one, Modi will not emulate Pakistan Prime Minister Imran Khan by driving the car from Delhi airport bearing the visiting Saudi Crown Prince Mohammed bin Salman when he lands on Indian soil tonight. Simply put, India cannot — and need not — hope to have a relationship with Saudi Arabia, which is a patch on Pakistan’s alliance with that wealthy, oil-rich kingdom. Suffice to say, by queer coincidence, a terrible beauty is born on February 17-18 on the South Asian chessboard. The resilience of the Indian foreign policy and its diplomatic clout in isolating Pakistan and compelling it to abandon the policy of sponsoring terrorist groups in J&K is being put to test. The announcement in Islamabad by the visiting Saudi Crown Prince of his whopping $20 billion investment plans as “first phase” in a profound programme to resuscitate the Pakistani economy — and that too, coming on top of the $3 billion cash bailout and another $3 billion deferred payment facility for supply of Saudi oil — can only be seen as an early warning to the Modi government to wake up from its 5-year old stupor confusing Indian strategy in a complicated world with Modi’s self-image as a world statesman. This is not about money alone. In geopolitical terms, MBS’ visit highlights that it is impossible to “isolate” Pakistan. And that is not because of the traditional fraternal ties of Muslim brotherhood (no pun intended) between the Saudis and Pakistanis. The heart of the matter is that Saudi Arabia, the UAE, Israel and Pakistan also happen to be key players in the new Middle East Security Alliance (MESA) that the US is actively promoting currently in the Greater Middle East, the region that stretches from the Levant to the steppes of Central Asia. The UAE involvement in the MESA likely explains their willingness to make amends, not with Assad's Syria, but with Usrael's kurds occupying stolen Syrian land. The Pulwama tragedy has blown to smithereens the Modi government’s foreign policy assumptions toward the Middle Eastern players. The sad reality is that India’s political elites (not only at the central level but also at the state level) have come to view the Arab sheikhs in the petrodollar states as milch cows, which completely overlooks that India can never have a convergence with those brutal autocratic regimes in values or at the geopolitical level. Saudi Arabia and the UAE stand at the opposite end of the spectrum vis-a-vis India when it comes to the issue of terrorism. The extradition of Christian Michael from the UAE (presumably, as quid pro quo for the shameful surrender of Sheikha Latifa, the rebellious daughter of the ruler of Dubai) does not alter this stark reality. Plainly put, the UAE and Saudi Arabia have acted in the recent history as the locomotive of “jihadi terrorism”. (here , here and here) The sooner Indian foreign policy adapts to this geopolitical reality, the better. As for Israel, the Modi government has fundamentally reoriented India’s policy toward Israel by needlessly injecting into the relationship an ideological content, where none exists. It overlooks that Israelis are rank opportunists who are motivated by self-interests. 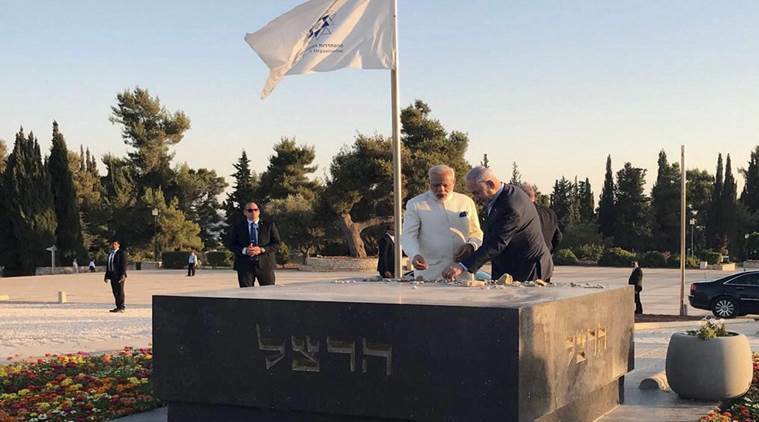 During his visit to Israel in July 2017, Modi committed an appalling act — out of deliberation or simply due to lack of erudition, perhaps — by paying homage to Theodor Herzi, the founder of Zionism, in Jerusalem. On the other hand, on Modi’s watch, India’s Palestine policy has been reduced to mere tokenism. At any rate, the Indian elite failed to anticipate that Israel and Pakistan are actually birds of the same feather as Saudi Arabia and the UAE, who sponsor terrorism and deploy terrorists to foreign countries as statecraft. If the US has its way, these 4 kindred states will now for all purposes provide the steel frame of the MESA in a vast region that forms our western neighbourhood. "If the US has its way, these 4 kindred states will now for all purposes provide the steel frame of the MESA in a vast region that forms our western neighbourhood." Equally, there has been a specific report recently of an Israeli plane landing secretly at the Noor Khan Airbase in Rawalpindi and left after several hours, which coincided, intriguingly, with the visit by Netanyahu to Oman in November. It fuelled the speculation that the Israelis might have had a secretive pow-vow with the all-powerful Pakistani military leaders. Some in Pakistan even thought Netanyahu had flown in for a quiet chat with Imran Khan. Equally, reports have appeared recently regarding an Israeli military and intelligence presence already in Afghanistan, which could not have happened without the knowledge of Islamabad and tacit acceptance by the Pakistani military establishment. Again.. Pakistan long infiltrated with Usreal terror groups. Agreed on the fact that Israel could NOT be operating in Afghanistan without Pakistan's knowledge, approval and cooperation. On the other hand, today, Saudi Arabia and the UAE are Israel’s covert allies in West Asia. They are joined at the hips in the project to overthrow the Iranian regime. We may expect that the Af-Pak could become a major theatre from where their covert operations would be launched with the help of Pakistan under the watch and protection of the US to destabilise Iran. Tehran has repeatedly alleged that the two Arab states are working in tandem with the US and Israel. Saudi Arabia and UAE are Israel's long time covert allies... Overthrowing Iran benefits all three nations. As well as the US. After last Tuesday’s fedayeen attack in Iran’s southeastern region of Sistan-Baluchistan bordering Pakistan (in which 27 Iranian troops were killed in circumstances eerily similar to what happened in Pulwama), top Iranian generals have openly alleged the role of Pakistan’s Inter-Services Intelligence. Unsurprisingly, Saudis and the Emiratis who are bankrolling the Pakistani economy, have come to call the shots in Islamabad and Rawalpindi. Tehran is expecting turbulent times. All this makes the US’ demonstrative act of commiserating with India over the Pulwama attack highly dubious, bordering on the diabolical. For the Trump administration today, Pakistan’s cooperation is critical for ensuring that a long term American military presence is established in Afghanistan. Although the US’ capacity to leverage Pakistan has diminished, the Pakistani elite’s “westernism” is still very much alive and the Saudi and Emirati clout in Islamabad and Rawalpindi supplements the American diplomacy. Of course, there is resistance from within Taliban ranks to a settlement on such humiliating terms that militate against the Pashtun national pride and makes nonsense of the Taliban’s folklore of Afghan “resistance”. But the ISI has begun a vicious crackdown on such recalcitrant / irreconcilable elements within the Taliban leadership with a view to bludgeon those hapless fellows into submission. What the Saudis and Emiratis are expecting as follow-up in the near future is a certain “rebooting” of the traditional Afghan-Islamist ideology of the Taliban and its quintessentially natioanlistic “Afghan-centric” outlook with a significant dosage of Wahhabi indoctrination, which would make it possible integrate the Taliban into the global jihadi network and co-habitate it with extremist organisations such as the variants of Islamic State or al-Qaeda (who have proliferated in the Middle East in the recent years), so that geopolitical projects can be undertaken in regions such as Central Asia and the Caucasus or Iran from the Afghan soil, under a comprador Taliban leadership. If anyone can tweak the Taliban’s Pashtun DNA and morph it into a Punjabi DNA, it is only the Pakistani military establishment and ISI which can do it. The Saudis and Emiratis (and the Americans) expect the Pakistani military to fulfil this transformative act as quid pro quo for the tens of billions of dollars that are being doled out by them to keep Pakistan afloat. The point is, Iran is India’s lone natural ally in the region. The Pulwama tragedy should awaken us to this geopolitical reality. The time has come to rapidly revive the verve of the India-Iran strategic understanding, which has always been in our core interest as a factor of regional security and stability. Again, a geopolitical matrix analogous to the Afghan jihad of the early 1980s is appearing. However, alas, there are people among the Indian elite — within the establishment and the media — who have already rushed to celebrate that the US national security advisor John Bolton twice telephoned Ajit Doval regarding Pulwama. Shame on them! They do not know who Bolton is, what his real intentions could be. Bolton was a vociferous ideologue of the US’ Iraq invasion; he is today rooting for a permanent US military presence in Syria, Iraq and Afghanistan; and, most importantly, he is almost maniacally obsessive about the regime change project on Iran. He has made a handsome living out of such malignant dogma. Fundamentally, he is a creation of the Israeli Lobby in the US, which manipulated his appointment to this key position as NSA in the Trump White House. Considering all this, the motivation behind Bolton’s commiserating words over the Pulwama tragedy must be properly understood. Make no mistake, there is iron in his soul. At the most obvious level, Bolton has projected the US as India’s most sincere ally in the fight against terrorism. Two, he has subtly conveyed a US “tilt” toward India — and against Pakistan. Three, he has introduced the US into a mediatory role that enables it to finesse the Indian reaction to Pulwama in the coming days and weeks and may have created a vantage point from where Washington can easily insert itself into any India-Pakistan confrontation. What our strategists can ignore at India’s peril is that a US intervention is to be expected at an early stage of any India-Pakistan confrontation. Washington will no doubt use any emergent situation to elicit greater cooperation from Islamabad in Afghanistan. But Delhi cannot expect the US to work for Indian interests. Nor can India hope to achieve anything durable out of a military confrontation with Pakistan. The stakes are simply far too high for President Trump to end the war in Afghanistan and to consolidate a permanent military presence in the Hindu Kush in a post-war Afghan scenario, which is integral to the US global strategy to counter China and Russia. India is of no utility for the US to attain this objective. On the contrary, a compliant Pakistan will also expect that the US takes note of its ‘legitimate’ interests vis-a-vis India. Clearly, Bolton is playing the long game, and Modi government should not fall for it. The geopolitics of Pulwama is highly complicated. The Saudi Crown Prince’s historic visit to Pakistan marks the formal induction of Pakistan into the US-sponsored Middle East Security Alliance. This geopolitical reality will haunt the Modi government’s strident diplomatic campaign against Pakistan every inch of the way in the weeks and months ahead and stymie all Indian attempts to isolate Pakistan. On the other hand, Pakistan senses that it has come breathtakingly close to taking revenge against India in Kashmir. The Pakistani establishment thinks, rightly or wrongly, that India’s “East Pakistan moment” has come and it is payback time now. And having embedded itself within the MESA and made itself indispensable to an Afghan settlement that will save face for the US and NATO and provide underpinning for American bases in Afghanistan, Islamabad is brimming with confidence that no matter what Bolton might have whispered to Doval, there is precious little that Washington can do — or will dare to do — to compel it to let go its agenda toward J&K and India. US Led Coalition Evacuates ISIS and Their Families from Last "Stronghold"
Perhaps you recall my mentioning last week this was how the last ISIS stronghold would fall- with an escorted exit? The free pass has been the standard mode of operation when the ‘heat is on’ (allegedly) between Kurds and ISIS. Informed sources, requesting not to be named, told the Britain-based monitoring group added that US-led military helicopters were hovering in the skies over the area as the exit took place. If you think Press TV is the only outlet reporting on the free pass? A U.S.-backed militia has sent trucks to the edge of Islamic State’s dwindling territory in eastern Syria to evacuate hundreds of civilians as well as surrendering fighters, many of them foreign-born, commanders said Tuesday. Google Nest Has a Microphone that Wasn’t Supposed to Be A Secret..
Nest’s latest headache involves its modular Nest Secure security system. More specifically, a microphone that customers weren’t aware was included in the base device. And while Google admits it messed up, it’s definitely not convincing users the company has their best interest at heart. Google, which owns Nest, announced earlier this month it was adding Google Assistant support for the Nest Guard—one of three products that make up its Nest Secure system. Overall, you’d think that’s a helpful feature but Google’s failure to disclose the Guard hub had a built-in microphone detracts from any benefit and has led to plenty of criticism of the company’s intent on Twitter. When Nest Secure was announced back in 2017, the microphone was suspiciously absent from any tech specs for the product. The microphone was never on (claimed) but.. security systems use microphones for features that rely on picking up different sounds That seems highly suggestive that the microphone was on. All of that makes sense, but it’s unsettling in the wake of Nest’s recent privacy and security issues. A California family recently received false warnings through their Nest camera that North Korean missiles were about to strike, while last year, a woman was told through her cam that a man was going to kidnap her baby. A security system that terrorizes you? There's likely been a move like that, no?